BLOOMINGTON, IN – The Dawgs took the track again this weekend at the Indiana University Relays with only a portion of their squad. SIU was one of 11 teams competing in Bloomington with two of the teams being nationally ranked. 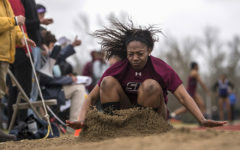 Southern sent 27 athletes to this weekend’s meet, but being small in number did not stop the Salukis from shining in several events on the track. The Salukis posted seven top five finishes this weekend including three second place finishes. Senior Matthew Bigelow competed in the heptathlon for the very first time this year, earning a second place finish with 4919 points. Bigelow entered the final day of competition in first place, but fell back into the runner-up position after placing eighth in the pole vault and ninth in the 1000 meter run. In the 60 meter hurdles, SIU earned one top five finish on both the men and women’s side of the event. Sophomore sprinter and jumper Theo Phipps finished second in the event running a time of 8.30 seconds, while junior sprinter Savannah Long took fourth on the women’s side clocking a personal best time of 8.98 seconds. 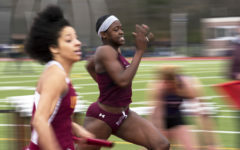 Junior middle distance runner Genesis Ewell continued to shine for the Dawgs in the 400 meter dash running a season-best time of 56.69 seconds to finish third. 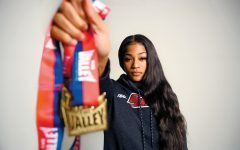 Top performing senior sprinter Tyjuana Eason kept the momentum for Southern sprints placing second out of 34 runners in the 60 meter dash with a time of 7.59 seconds. Deanna Price, former Saluki thrower and now volunteer coach, took first place in the weight throw with a toss of 24.57 meters. Price’s throw is currently the best mark in the U.S. for the event and rank’s as the 11th best mark in U.S. indoor history. Junior Alexis Roberson, recent winner of MVC Field Athlete of the Week, finished third in the event tossing the weight 20.81 meters out. Sticking with the trend on the men’s side, Southern track alum Jared Kern earned a first place finish in the shot put with a toss of 19.60 meters, while senior Saluki Adam Kessler took third place with a toss of 19.09 meters. Long, Ewell, Eason and freshman sprinter Julie Lutz, joined together as the meet closed to place third in the 1600 meter relay clocking a time of 3:45.61 beating the Indiana A team. This meet’s completion brings SIU one step closer to the MVC Indoor Championships with only two meets remaining in the indoor season. So far this indoor season, the Salukis hold six number one rankings in The Valley and two NCAA Top-15 marks. You will be able to watch the Dawgs in action next weekend in the SIU Recreation Center as they host the Don DeNoon invitational. Multi event athletes will kick of the competition at 9:45 a.m. on Friday.